The new Super Heroines In Distress web-series by Matteo Piccinini with the episode Silver Babe And The Drug Dealers is a response to all classic superheroes. Sherlock Holmes, Conan the Barbarian and Tarzan: what do they have in common three different characters among themselves? They are all predecessors of our current collective imagination of what is now a superhero. However, the first real superhero was born by Jerry Siegel and Joe Shuster in 1938, is introduced for the first time in the first number of Action Comics Superman. Actually, two characters in costume have preceded Superman, but he is still considered the first superhero ever. Start with him the superhero cartoon age. Seeing Superman’s success, in the following months DC Comics rides the wave introducing other superheroes like Batman, Aquaman, Flash and of course Wonder Woman. In parallel, the lineup of by Marvel Comics begins to develop. In the same period, even the very first parody of Quality Comics was launched with the launch of the Plastic Man character. In this direction, director Matteo Piccinini also moves with his new web-series Super Heroines In Distress. 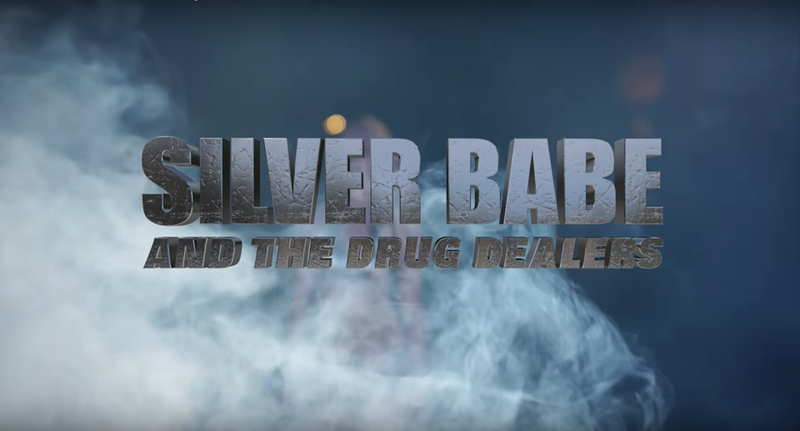 Silver Babe And The Drug Dealers is a web-episode that is already depopulating on Youtube by stimulating the interest of a major super-heroes male fanbase. The web-series is deliberately set in a grotesque and exaggerated view with the desire to create a final quality product that is modern and timely. The protagonist Silver Babe, played by a beautiful Daria Kolesnikova, is an extraordinary superhero, extraordinary and very provocative. His costume is based on classic cosplay present at events and fairs such as ComiconCon or Lucca Comics & Games often frequented by superhero fanbases. The word “cosplay” is composed of two English words, namely “costume” and “play” (game or interpretation). It consists of dressing yourself up as a recognizable character of a video game, comic book or movie and playing the role. During these fairs, true competitions take place to determine the best cosplayer. In the first episode of the Silver Babe web-series, two drug dealer are performed by Alessio Cherubini and Gabriele Tiziani, both actors in cinema and theater, but in the movie they also show us some great fighting skills simulated by real stuntmen. Fighting between actors, in fact, seems realistic at the right point, while still taking into account the exaggeration typical of superhero movies and the grotesque concept that the director wanted to give to the web series, as it is still a parody. The director’s skill lies in the fact that he is able to create a quality product from a technical point of view, although parodies in general tend to underestimate this aspect. In this way, Piccinini manages to bring an underground product outside his fan base. During the shooting, the general mood between the actors and the director was pure fun, the understood between them allowed the birth of the first episode of the web-series that will continue to go online on the Youtube channel of the director Matteo Piccinini. The end of the episode is intuitive with Silver Babe swearing revenge on drug dealers. It only remains to wait for the sequel!